I could eat crab cakes at least once a week. I’m a seafood lover and I try to get my seafood fix as often as possible. I’m also trying to lighten up many of my recipes in order to make them better for me. That’s one of the reasons I make my Lightened Up Crab Cakes with Mazola® Corn Oil. A clinical study showed Mazola Corn Oil reduces cholesterol 2x more than extra virgin olive oil. To learn more about this claim, see Mazola.com. To lighten up my Crab Cakes recipe, I replaced the whole egg with just the egg white and I used Greek yogurt in place of mayonnaise. Instead of deep frying the cakes, I used Mazola Corn Oil for sautéing. The results are a lighter, delicious crab cake that the entire family enjoys. 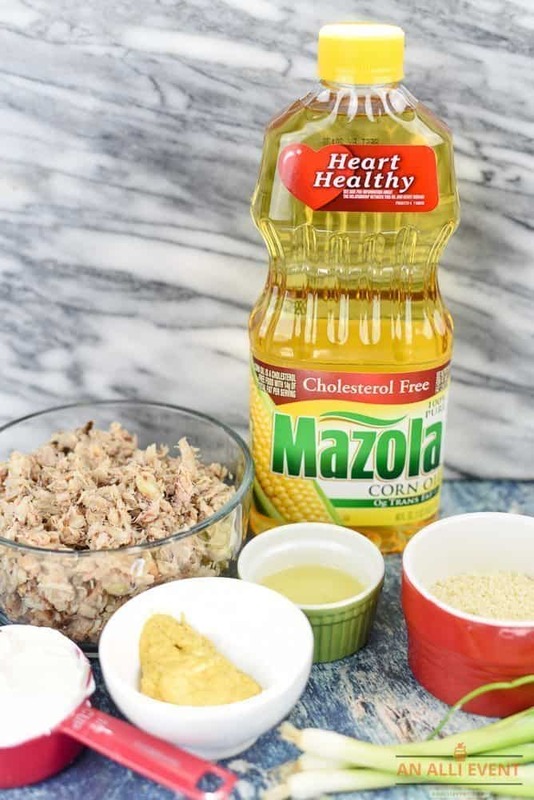 Cooking with Mazola Corn Oil is one of the heart-healthy choices I make for my family. Also, the taste is neutral so the natural flavor of my food stands out. It’s perfect for making a marinade or dressing. 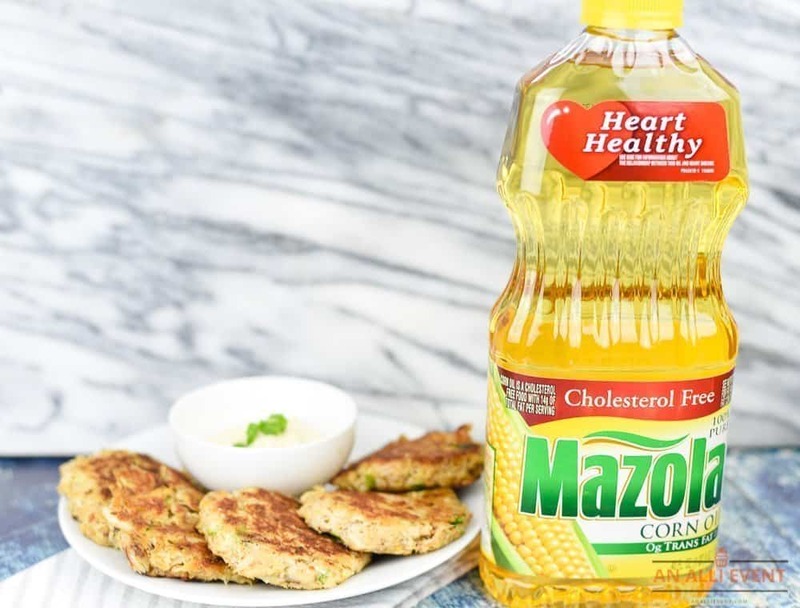 All-purpose Mazola Corn Oil has a high smoke point and works great for a variety of cooking methods, including stir-frying, sautéing, grilling and baking. The smoke point simply refers to the temperature at which an oil starts to burn and smoke. All cooking oils have a smoke point and once that point is exceeded, the food’s flavor and nutritional values are negatively affected. Mazola Corn Oil has a higher smoke point than most cooking oils (450º). That’s a good thing! For this recipe, I use premium canned crabmeat. If you use fresh crabmeat, pick out and discard any shell or cartilage. Combine crabmeat, panko bread crumbs, and green onions in a medium bowl. Add 1/2 cup Greek yogurt, one egg white, one tablespoon brown mustard and 1/2 teaspoon hot pepper sauce. Mix well. Shape crabmeat mixture into eight cakes. Heat a large nonstick skillet over medium heat. Add one tablespoon Mazola Corn Oil. Add four crab cakes and cook for 4-5 minutes per side or until golden brown. To prepare the dipping sauce, mix remaining 1/4 cup Greek yogurt, 1 tablespoon brown mustard and 1/2 teaspoon hot pepper sauce in a small bowl. Serve crab cakes warm with dipping sauce and garnish with lemon slices, if desired. 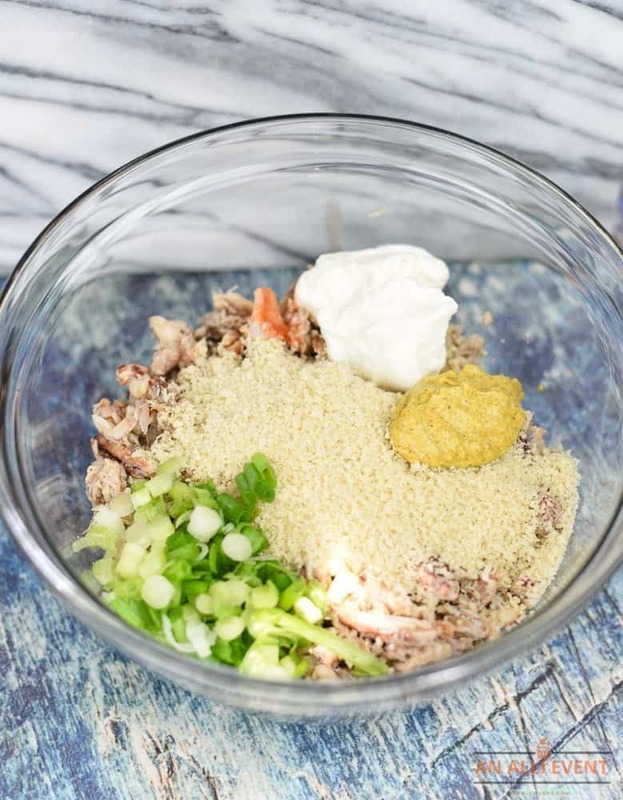 In a medium bowl, combine crabmeat, panko bread crumbs and chopped green onions. Add 1/2 cup Greek yogurt, egg white, one Tablespoon spicy brown mustard, and 1/2 teaspoon hot pepper sauce. Mix well. Shape crabmeat mixture into 8 cakes. Heat a large nonstick skillet over medium heat. Add one tablespoon of Mazola Corn Oil. 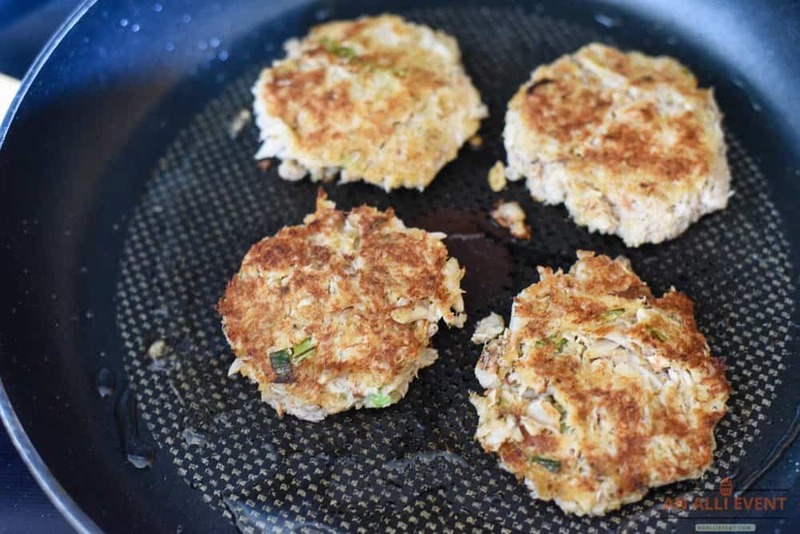 Place 4 crab cakes into the skillet and cook 4-5 minutes per side, or until golden brown. Repeat with remaining crab cakes. Mix remaining Greek yogurt, mustard and hot pepper sauce in a small bowl until well blended. Serve crab cakes warm with dipping sauce. Garnish with lemon wedges if desired. The next time you’re craving seafood, try my lightened up crab cakes. Also, make sure to visit Mazola.com for more delicious recipes. Crab cakes is something my family enjoys as well. Have to have one to two different dipping sauces to go along with them. Will be trying your recipe out for sure. These sound pretty tasty! My husband and kids would love them! I’ve never been into seafood, but they just love it. Sometimes I’ll make them some and these look like something they’d gobble right up. Those crabcakes looked amazing and I love how you lightened up the recipe. Thank you for that smoking point lesson and I will use that oil next time. I adore crab cakes and can’t wait to try this sauce. I haven’t used Greek yogurt before. Thanks for sharing. This recipe looks yummy. I can’t wait to try it. I know my family would love it. This sounds so delicious. Crab cakes is one of my favorite meals to get outside, but I never made them at home. I love how you made a lower-calorie, lighter version here!! These crab cakes look fantastic! They would make an excellent appetizer for all of those upcoming holiday parties too. Oh I love crab cakes! This sounds like an easy to make and delicious lighted up version too! That sauce though. It is the best! We love crab cakes. I haven’t made any in quite a while, but this post has me craving them. I like the fact that you used canned crabmeat because it makes the recipe so much easier and much accessible. I’m so intimidated to make things like crab cakes but this recipe seems doable! 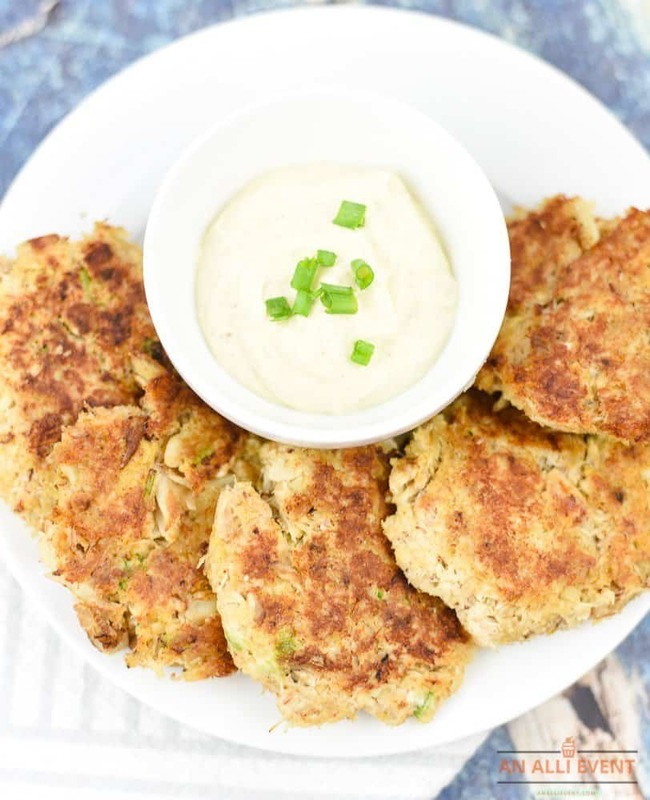 I have never made crab cakes, but these look good, and easy enough to make! It’s nice to have some meal ideas that are a little different from what we usually cook. I must confess, I haven’trtied making this one and since I was able to see this post, I’ll be bookmarking this so I can make and finally taste this recipe. Wish me luck! My husband would really enjoy these. He is such a huge fan of crab cakes. I miss having crab cakes. It’s been a while since I made it, it’s just hard to find good crabs around here. I have to make this recipe this weekend. I love seafood, especially crabs! The crab cakes look amazing! Being landlocked, we don’t eat a lot of seafood, but my husband would love this. He grew up on the coast and loves fresh crabcakes. I’ve never tried making my own! But I’m feeling so inspired. Knowing they’re lighter means I can work them into our meal rotation more frequently too. Crab cakes are a huge favorite here. I haven’t tried them with yogurt, so this I need to try out.